In ancient times the amethyst was very rare. The amethyst is a familiar stone by royalty and dignitaries. In ancient times amethyst was only reserved for members of the royal families. A wellknown amethyst parure, in possesion of the Swedish royal family, is worn at important occasions by Queen Silvia, Crown Princess Victoria or Princess Madeleine. The amethyst is one of the best known varieties of quartz, other examples are rose quartz, rock crystal, citrine, prasiolite and smoky quartz. Amethyst occurs in shades of pale lilac (rose the France) to deep purple and is found in various locations around the world such as Brazil, Mexico, USA, Australia, India, China and Russia. 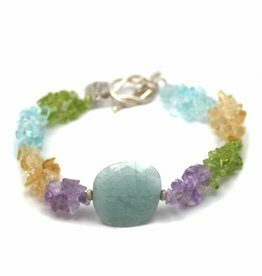 Visit purple for bracelets with amethyst or prasiolite for earrings. 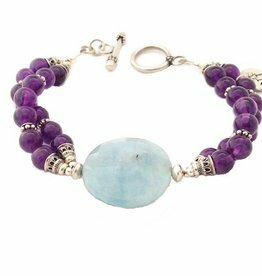 The amethyst gives peace, clarity of mind and relaxes. Magical power: amethyst could expel drunkenness and even offers protection against witchcraft and sorcery.Chakra: seventh or crown chakra. 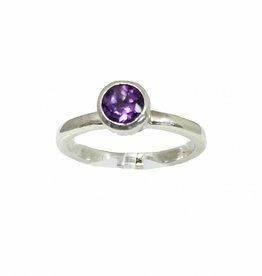 Amethyst belongs to the zodiac sign Pisces and is the birthstone of the month March. 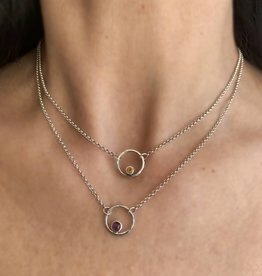 Short spiritual silver necklace with the Circle of Life with amethyst. Length necklace 39,5 cm, with an extension chain of 5 cm.